The Monarch flashes its LEDs when its antennae touch. But it's also clever! It uses a clock source and shift register in a particular configuration in order to generate its patterns. Through it, one can learn about the basics of digital design, clocking, and randomness. It is a third in a series of electronic 'bugs', the first is The Lady and the second is The Gent. 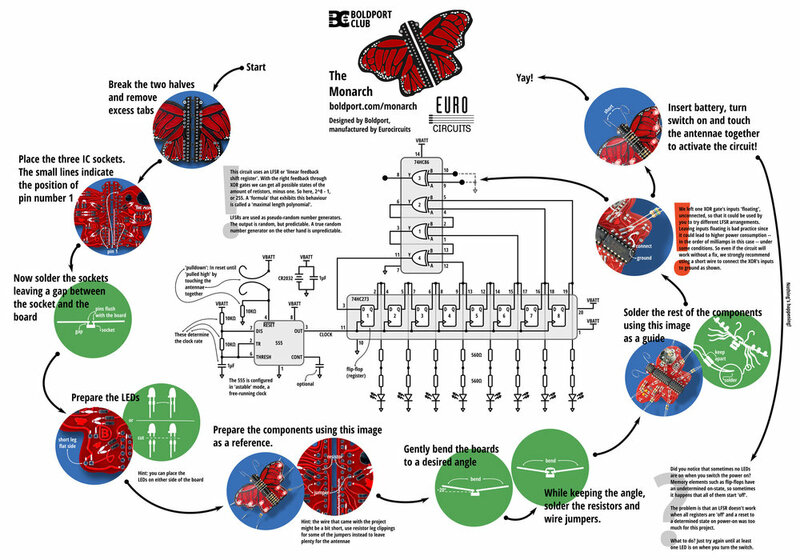 The Monarch was project #18 of the Boldport Club. Follow the infographic paying attention to the following information: the wire in the kit might be a bit short so use resistor leg cutting, the gap between the socket and PCB, and the recommended floating XOR input fix.